The little-noticed announcement of “Lightning Voice” from Salesforce earlier this month gives another clue towards their strategy. More importantly, it reminds us that Salesforce already has many fingers in the call center pie. There is definitely a danger of stepping on partnership toes. In fact, that’s the dominant thought in two pieces covering Lightning by Lauren Horwitz of TechTarget. Recent upgrades to Salesforce Lightning may benefit customers who can now build new apps — but how will it affect partners who have apps that tackle the same problems? I think Salesforce’s maneuvering around the different pieces of the call center puzzle is not accidental at all. But No Inbound: Is it a Third Rail or Phase 2? Note what was not in the announcement: inbound. Handling inbound calls is still the crown jewel of the call center vendors. Outbound has long been seen as a low-value feature that lots of players could peel away from the core call center offering. Inbound is what drives the sale of multi-million dollar call center systems. Perhaps Salesforce is stopping short of offering inbound voice features out of deference to the many call center partners it has. Companies like InContact, LiveOps and Transera have invested heavily in Salesforce integration. It’s a partnership that works well: Agents sit in front of Salesforce-based consoles with the “screen-pops” driven by the inbound calls. Both the call center vendor and Salesforce get to sell a seat license per agent. Also on that list is TalkDesk, the superstar newcomer that has conquered the low-end of the market with a largely self-serve model (“Create a Call Center in 5 Minutes”). Salesforce was a major participant in TalkDesk’s recent $21M round of funding. Another reason to avoid inbound is that it is more demanding to deliver. Inbound is mission critical for most companies. If your call center can’t accept calls, you could be losing sales or even customers every minute. If you can’t make outbound calls, consequences are less dire. As reported by Re/code’s Arik Hesseldahl, Lightning Voice is powered by Twilio. Guess who is a major investor in Twilio? Yep, Salesforce. And guess what powers Talkdesk? Twilio. What to make of all this? 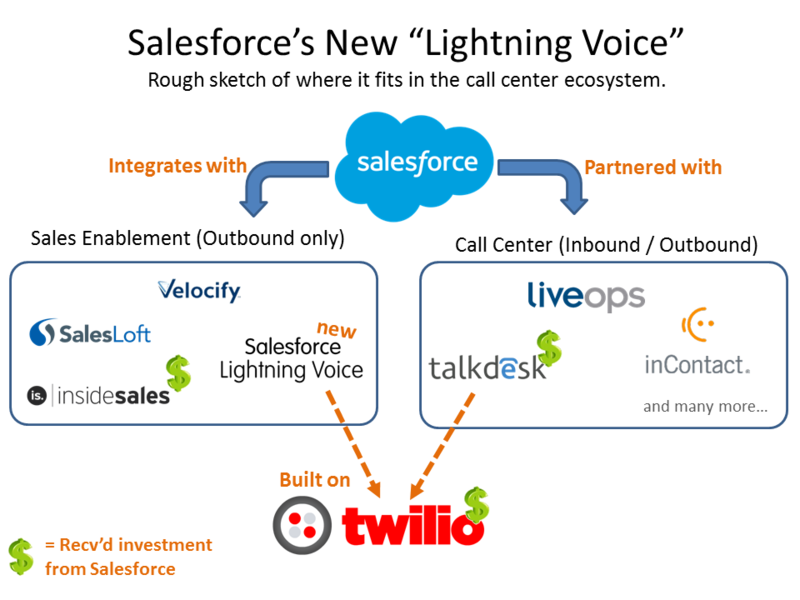 Perhaps Salesforce is watching TalkDesk to see if a Twilio-powered call center can really scale up. If it does, Lightning Voice could expand into inbound functionality and – boom – every call center vendor is under major threat: Avaya, Cisco, Genesys, Aspect, Five9, InContact, Interactive Intelligence. (Their combined call center revenues add up to around $4B annually.) When companies deploy a new call center, a big part of the process is CTI integration – getting the call center software and CRM software to work together so that the agent’s get the right info. For many VARs, this is what pays the bills. As Paul Fischer points out this could all get streamlined with Lightning Voice. So there’s another constituency that is threatened. Companies like TalkDesk and NewVoiceMedia have built call center businesses on top of Twilio, which has allowed them to grow very quickly. They bypassed the years and millions of dollars that the previous generation of companies had to invest in building all the core technology of a call center. But that’s a double-edged sword. If they can do it, so can others. And no one is better positioned to do that than Salesforce. The big takeaway here is the power of a platform and API for voice. No matter what happens, Twilio is the big winner. This is why Cisco bought Tropo (formerly part of Voxeo), and it’s why Avaya is placing such a big emphasis on their new Engagement Development Platform (EDP).